The NRA has come under withering attack by advocates of increased gun control since the school shooting in Florida at Broward County’s Marjory Stoneman Douglas High School, which left 17 students and staffers dead. Instead of blaming the FBI, which ignored at least two tips about the gunman’s intentions; or the local police, which visited with the young man nearly 40 times; or the armed deputy sheriff security guard who failed to confront the gunman using an AR-15 rifle; and the shooter himself, who committed the heinous crime; those clamoring for further restrictions on the Second Amendment have chosen instead to blame the NRA, pro-gun rights politicians, and even the Second Amendment. Even President Donald Trump, who was strongly backed by the NRA in the last presidential election, has publicly differed with the nation’s largest gun-rights lobby, calling for raising the age requirement to purchase a weapon, from 18 to 21. One wonders, if an 18-year-old is too irresponsible to legally purchase a firearm, is he or she too irresponsible to vote — or to carry a gun in the U.S. military? Should 16 year olds, who have the most car accidents, lose their licenses to drive until they are 21. Or should the cars themselves be banned? More Americans die in car crashes than die from gun shots. In his fiery speech, LaPierre argued that “European socialists” are taking over the Democratic Party. He argued that many leftist groups — including Occupy Wall Street, Black Lives Matter and Antifa — want to eliminate the requirement for due process enshrined in the U.S. Constitution. “The elimination of due process is the very gold standard of the socialist state,” he said. One of the proposals of LaPierre’s own NRA bears careful scrutiny itself, when it comes to the issue of due process. The NRA has argued that persons with severe mental illness should be precluded from purchasing or owning a firearm. While this seems, on the surface, to be a reasonable proposal, one what the criteria for determining who is too mentally ill to be allowed to possess a firearm? After all, Joy Behar of The View recently alleged Vice President Mike Pence was mentally ill due to his Christian views on prayer; some have even charged that President Donald Trump is suffering from mental problems. In the old Soviet Union, any person who opposed communism was considered to be suffering from mental illness. LaPierre’s call for the maintenance of “due process” before an American citizen is denied his life, liberty, or property, or his constitutionally protected rights, would also seem to be relevant to the issue of denying a gun to a person simply referred to as mentally ill. Should a person be very careful about going to a mental health counselor, if he cares about maintaining his constitutionally protected right to keep and bear arms? On Thursday morning, Trump tweeted that he will push for comprehensive background checks “with emphasis on mental health.” Trump should also be queried as to how “mental health” issues so severe as to keep someone from owning or possessing a firearm is to be determined. In the wake of the latest horrific school shooting, Americans are understandably frustrated, and are subject to emotional pleas to “do something” about repeated mass shootings. The media, of course, throw gasoline on the fire, offering solutions that make little sense — if the intent is to make us safer. Depriving the American people of the means to defend themselves has the opposite effect. So does sending our kids to schools (gun-free zones) where adult staff and teachers are denied the means to protect the students entrusted to their care. Repeatedly, we hear inane comments such as, “No one needs an AR-15 to go deer hunting.” No, but that is not the reason for the inclusion of the Second Amendment in the Bill of Rights — rather, the amendment’s purpose is to safeguard a last line of defense against a tyrannical government. In a recent Marist College poll, 71 percent of Americans say there should be more restrictions on gun ownership. But, as a spokesman for the Gun Owners of America recently said on Fox News’ Laura Ingraham show, the Second Amendment “trumps” a poll. If a right protected in the Bill of Rights can be discontinued simply by citing a poll taken in the aftermath of an emotionally charged event such as a school shooting, then what is the purpose of even having rights protected? After all, a majority of Americans do not agree with Hinduism. Does that mean Hinduism should be banned, despite the protections offered religious liberty in the First Amendment? Should the protections secured in the Constitution be subject to change by a Marist College poll — which may or may not be accurate? 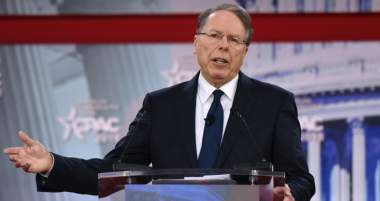 LaPierre told CPAC, “The whole idea from some of our opponents that armed security makes us less safe is completely ridiculous.” It no doubt is ridiculous, as is the push to make the entire country one vast gun-free zone. if Americans do not want to lose their right to keep and bear arms, the Second Amendment notwithstanding, they better begin to educate their friends and neighbors, and their members of Congress on just why the Second Amendment is included in the Constitution. And do it quickly.